Where's a scene challenge when you need one? 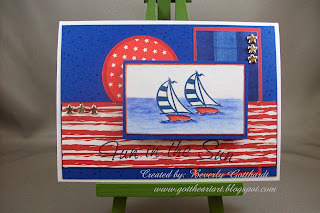 I said recently I didn't feel I was that proficient at scene stamping, but this little sailboat race turned out pretty cool. (I think) I figured out where I wanted the horizon then stamped the boat in front, masked it off and stamped the boat behind. I used my PrismaColor Pencils and Sansodor Solvent to do the sea and sky, after you color in your colors take your blending stump and go over the whole thing in small circle motions to blend all together, then laid in the red on the boats and blended them the same way. They are so small all I had to do was kind of pat to blend. I'm pretty much a terra firma girl, but this boating expedition looks kind of inviting. Digi Doodle Shop's Best DDSB#14-Circles and Dots! Supplies: White Card Blank 4" X 5 12" Halcraft, Papers: DCWV Brights Card Blocks, Generations Stackers, Stamps: Hero Arts-Month June, Inkadinkado-97521 Coastal/Maritime, Stamps by Judith-stick dots, Ink: Stampin Up-Not Quite Navy, PrismaColor Pencils, Sansodor Solvent, CTMH markers-outdoor denim, cranberry, Coluzzle shape template-circle, Stampin Up-1 3/4" circle, mini star brads-The Paper Studio Spare Parts, pop dots. Great work! I love the scence you have created. Thanks for joining us at CCC. 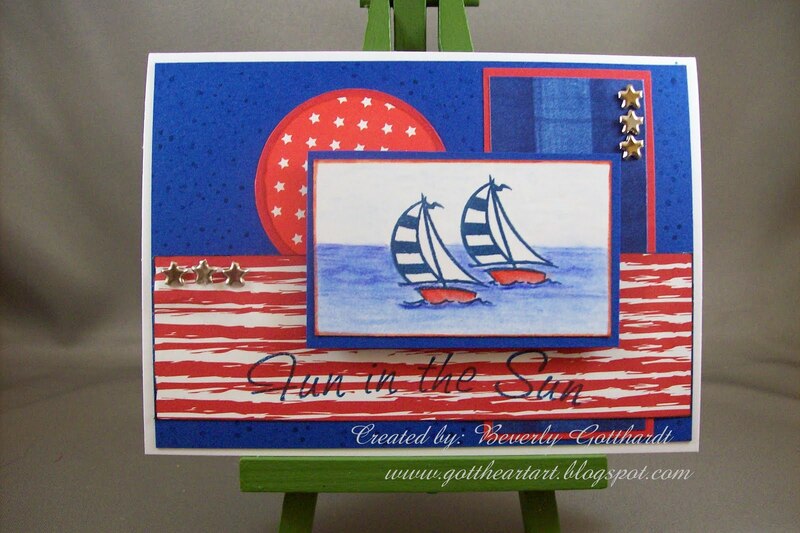 Very lovely card, and a wonderful image to use for the 4th of July Holiday. Thank you so much for entering this in our challenge at Digi Doodle Shop's Best. Lovely! Thanks for joining us at Digi Doodle Shops Best. Beautiful card! You have done a great job with those sailboats! 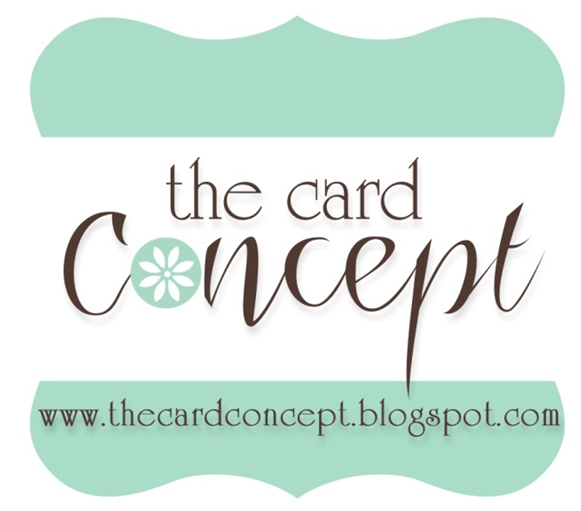 Thanks for playing again at Stampin' Royalty. Great Summer card! Wonderful scene, so creative! Your project is delightful! 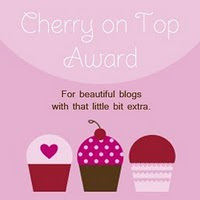 I am soooo glad you went round in circles and got dotty with us at Digi Doodle Shop's Best! Good Luck! Wow - what a great card. Those boats are too cute. Great job with the doubles challenge here at Stampin' Royalty. Gorgeous card and love what you've done with the image!!! Thanks for playing along with the Digi Doodle Shop's Best!